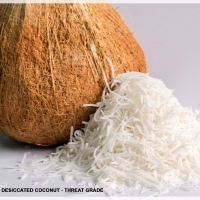 Browse desiccated-coconut suppliers by country and region. 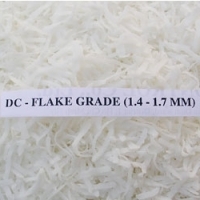 Desiccated coconut, the edible dried-out shredded coconut meat was prepared from fresh kernel of fully matured coconut and it is available in coarse, medium and fine grades and also in special grades such as threads, strips, granules etc. 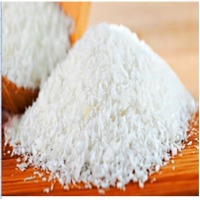 Good desiccated coconut is crisp, snow white in colour with a sweet, pleasant and fresh taste of coconut kernel. 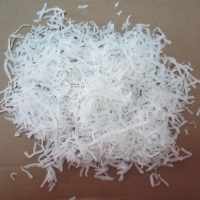 Desiccated coconut, a commercial product was manufactured from the white part of the meat after removing the brown parings. The meat is shredded or disintegrated and dried in hot air driers at 140-170oF to 2 per cent moisture content (fat 65-68 % and Solids nonfat 30-32%) and used in the manufacture of cakes, pastries and chocolates. 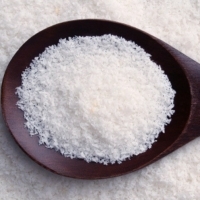 Desiccated coconut is the disintegrated, white kernel of coconut processed under strict hygienic conditions and dried to a moisture content of below 3.0 per cent. 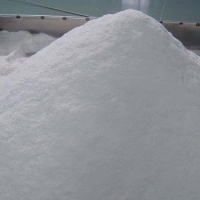 It is a food product which is ready and fit for direct human consumption. 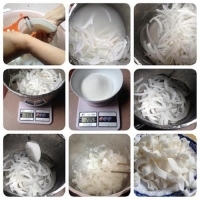 Desiccated Coconuts : Desiccated coconut, the edible dried-out shredded coconut meat was prepared from fresh kernel of fully matured coconut and it is available in coarse, medium and fine grades and also in special grades such as threads, strips, granules etc. 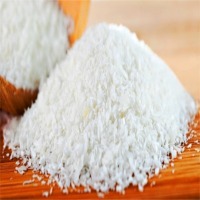 Good desiccated coconut is crisp, snow white in colour with a sweet, pleasant and fresh taste of coconut kernel. Desiccated coconut, a commercial product was manufactured from the white part of the meat after removing the brown parings. The meat is shredded or disintegrated and dried in hot air driers at 140-170oF to 2 per cent moisture content (fat 65-68 % and Solids nonfat 30-32%) and used in the manufacture of cakes, pastries and chocolates. 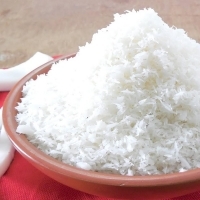 Desiccated coconut is the disintegrated, white kernel of coconut processed under strict hygienic conditions and dried to a moisture content of below 3.0 per cent. It is a food product which is ready and fit for direct human consumption. Short on time? 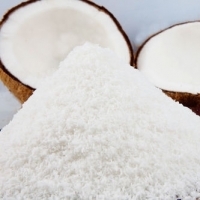 Let desiccated-coconut sellers contact you. We are Vietdelta Industrial Company in Vietnam. We are manufacturer and exporter all of coconut: Fresh, desiccated, shell, charcoal,â?¦ I would like to offer: Desiccated Coconut Specification: Supplying Period : All the whole year Ingredient : 100% pure coconut natural Color : Natural White Flavor : Mild and sweet coconut taste with no off-flavor Fat content : 62- 66 % min SO2 residual : 50 ppm max FFA : 0.3% max (as lauric acid) Moisture : 3.0% max E.coli : Negative Salmonella : Negative Packing : Small retailing package: 400grm / foil aluminium box , 24 boxes/ carton , 11 MT/ 20ft Bag packing: in inner PE bag, 3 Draft paper bag cover, and PP outside ( if request) 8/10/25/50 kg. Normally, 25kgs/ bag or customized. Based on good quality items, stable capacity as well as very good prices. We really hope that we both parties could have a chance in order to cooperate together in the future. 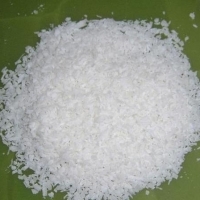 Our company has risen to prominence in the field of manufacturing, exporting and supplying of Desiccated Coconut Powder that is highly in demand by our customers owing its superb essence and freshness. 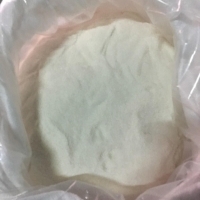 The offered coconut powder is processed by using the well tested coconut and the latest techniques. This coconut powder is highly appreciated for its attractive features like optimum purity etc. High Fat Content 65% Used as ingredient in savoury and Sweets Coconut Chutney Coocnut RIce High Grade and Export Quality 12 Month Shelf Life Available in custom packing Minimum Order 5 tons Payment Terms-50% Advance and balance against Bill of Lading Copy. Contact us for Pricing.